Struggling with a summer drought is no fun, and keeping your plants quenched and happy can feel like a non-stop battle. Don’t be a slave to the watering can; here are our tips to help you deal with drought conditions in your garden, so you can continue to enjoy good harvests this summer! When water’s precious it pays to be prudent. Concentrate your watering where it’s needed: young seedlings to help them establish, salad leaves to stop them wilting, fruiting vegetables like tomatoes and anything growing in a pot. Using a watering can? Try two – one for each hand. It will help you balance and you’ll be able to water twice as quickly. If your water source is some distance from your beds, it also means less walking back and forth. Another option is to use a portable tank to cart water to where it’ll be dispensed. Two watering cans are better than one! A strong spray from a hose can knock plants about or blast potting soil out of containers. 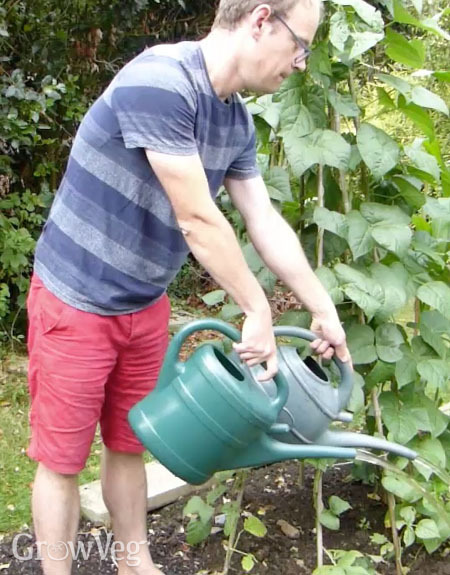 Get around this problem by simply placing the end of the hose in a watering can so that it fills as you pour. This means you can water carefully and precisely, enjoying the convenience of a hose – without wasting a drop! Watering pots from the bottom, rather than the top, can save a lot of time – and water – in hot weather. Fill up a suitable-sized reservoir, adding any liquid feed you’d like to apply at the recommended rate. Now sink your pots into the water and simply walk away, leaving them to soak up the liquid for an hour or more. You can speed things along by adding a splosh of water to the top of the pot before it’s left to soak. This technique ensures a really thorough watering that makes very efficient use of water. An automatic irrigation system, connected to a timer, will take the strain out of watering. Set it to come on very early in the morning, before things heat up. The best setups use drip irrigation or soaker hoses to deliver water right at the base of plants, near the roots. Some can even be fitted to water barrels, so you can make the most of any rainwater you’ve managed to collect. Drought can play havoc with seedlings, hampering germination and causing young plants to struggle. Here are a few ideas to help. In hot, dry conditions getting seeds to germinate can be tricky, particularly those of cool-season crops such as lettuce. The solution is to wet the seed drill before sowing, to give them the cool, moist surroundings they crave. Water along marked-out drills. Allow the water to completely drain away, then fill and drain once again before you sow. Once you’re done sowing, cover the seeds back over but don’t water again until after germination. The moisture in the drill will drain through, encouraging the seedling’s roots to follow. Young seedlings, and cool-season crops in general, perform better under the protection of some shading in hot summers. 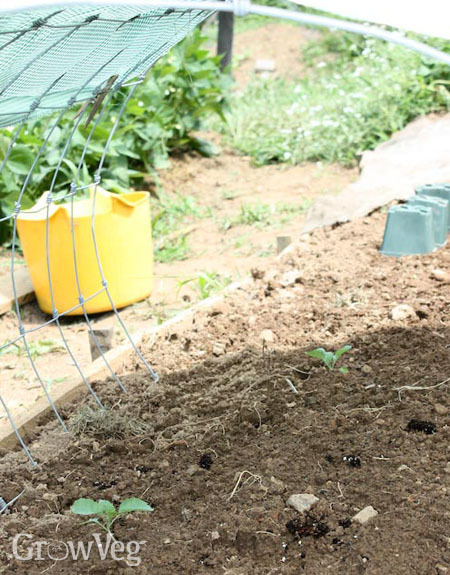 Prioritize shady areas for crops that prefer cooler conditions, such as salad leaves. You can use taller crops to shade shorter ones, but in scorching weather drastic action may be needed. Shade cloth can cast just enough shade to keep your plants happy in severe heat – and it’s easily removed when the weather turns cooler. Suspend it over plants to help them keep their cool. Mulches are a must during any summer drought, and a mulch of organic material such as compost, leaf mold or even dried grass clippings is best. This extra layer serves a few purposes: it shades the soil from the sun, helping to keep it cooler, and it acts as a lid on the soil, dramatically reducing evaporation. Thoroughly soak the ground before adding your mulch. If it’s exceptionally dry, water again a few hours later to recharge all that valuable soil moisture. Now lay the mulch so it’s at least an inch (2cm) thick around your plants. Fruit trees, canes and bushes can be mulched with chunkier materials such as bark chippings, or fibrous materials like straw. Again, take care to water well before laying it. Mulches may not be very high-tech, but they are incredibly effective in a hot summer. I hope you’ve found some of these ideas handy. They’ll all save you time while ensuring your plants stay in the best condition possible. If you can offer any further tips or advice, please go ahead and share them in the comments section below. "Thank you for these excellent tips! I'm actually already using two watering cans for watering my plants and it's saving me twice the amount of time. I'm considering using a portable tank in the near future though. Any suggestions?" "Advice from my 96yr old mum ... hoe, hoe, hoe - breaking up the dry top surface helps cut down the amount of water drawn to the surface. " "Hi Ollie. I've not used a portable tank myself, but I'm sure you could either source one online, or even make one yourself. Obviously make sure the tank is well-supported on wheels can an easily be moved about the garden when full. One with a lid would be ideal, to stop the water sloshing out when you're moving it about." "Hi Caroline. Thank you so much for sharing your mum's sage advice. It's always worth seeking pearls of wisdom from the most experienced gardeners."